Having just taken a closer look at my photo I would agree. Mine where defoliating a blackthorn & it looks very similar in your photo. Does that fit with feeding habits of the Small Eggar? We used to look for Lackeys on Blackthorn and found a few on hawthorn. Small Eggars (I had to look it up) seem to be similar, but a few other occasional foodplants are mentined. have seen this on blackthorn about a quarter of a mile away, but not here. 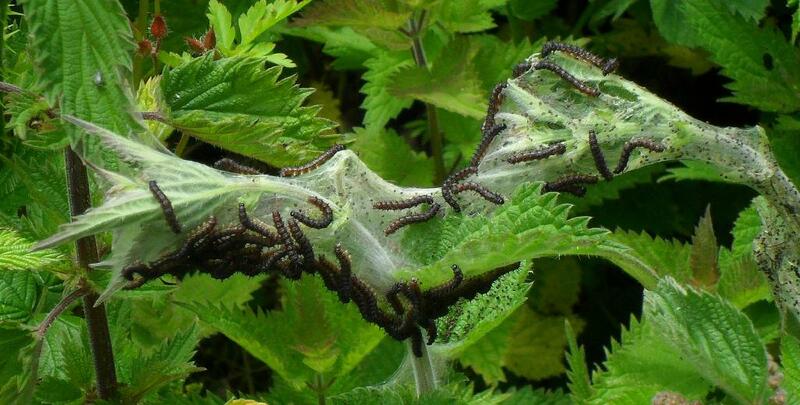 Not moths, a nettle dwelling butterfly caterpillar probably, but can anyone identify which one? They're quite small so probably quite young and yet to get their full colouration. The only one I know which does that is the small tortoiseshell - which is why they are so vulnerable to the modern need to "Tidy everything up" !